Dinner Plate 1" H x 10.5" Diam. Salad / Dessert Plate 0.75" H x 7.5" Diam. Bread & Butter Plate 0.75" H x 6" Diam. Saucer 0.75" H x 5" Diam. Mug (6 oz) 3.75" H x 3.25" Diam. Soup Plate 2" H x 9" Diam. 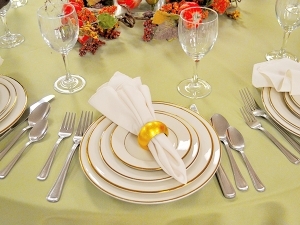 Gold is a regal color, so when you are preparing to serve a crowd at a wedding reception or party and want to make a positive impression, this dinnerware is perfect. 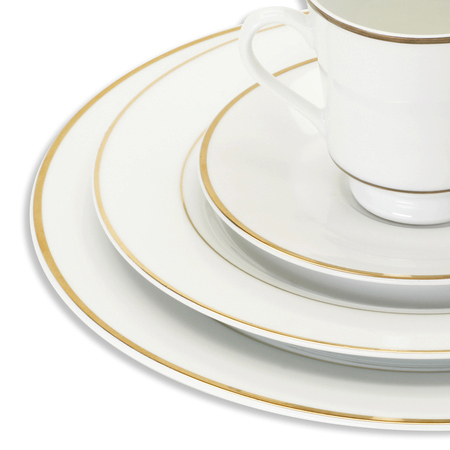 Each piece has a gold rim, which brings a royal appearance to any table. The porcelain construction is classic and durable, so it blends with all decors. When you want to welcome your guests in style, look no further than this collection.